On the morning of my daughter's cat party, she carefully hung gift bags up by the mantel as we cleaned and decorated the house. It's become a bit of a tradition. Guests always enjoy arriving and instantly seeing that something special is waiting for them. I used bits of fabric from one of my overflowing scrap buckets. I sort my scraps by size and color. This makes it easy when I have a specific project in mind. Each bag is white, but not exactly matching. I carved a party cat, stamped it on the front, and added a quick drawstring with twill tape. On the back of each tag was the recipient's name. As you may have noticed, there was no real color scheme to the party- we used what he had. Fabric stamping ink in dusty purple- sure. Lots of extra twill tape in yellow- yup. Matching dishes and cups- nope.Various bunting and garlands from previous years- hang them up. It was eclectic. It was just right! Do you ever get an idea in your head and can't stop thinking about it? That's how it was for my daughter and pin stick the hat on the cat. Poor girl, we didn't get to it until the morning of. But it ended up being fantastic to give her a focus for all that excited pre-party energy.She channeled it right into this sweet kitty! 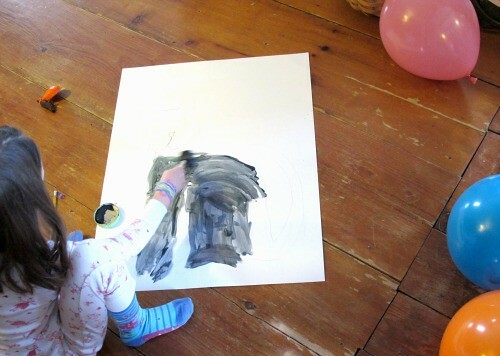 We sketched the body together and then she painted it. 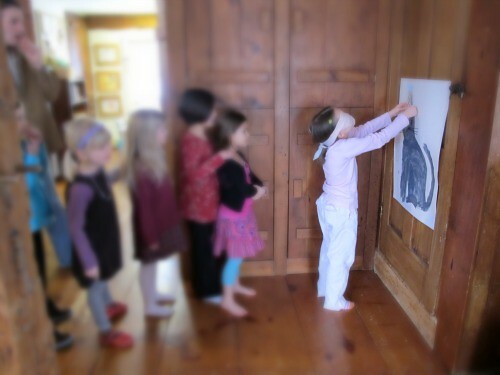 I did a little outlining, but she truly created almost all of it and was so proud to show it off when her friends arrived. The hat is just a piece of cardboard with paper pasted on one side.Those eyelashes... my favorite part! A donut of Duct tape is on the other side and stayed sticky for several rounds of playing. "Around and around goes the cat... then she stops just like THAT!" I chanted as I slowly turned each child in circles before pointing them in the right direction. although there were other activities in the queue, masks invite dramatic play. Making sure there was plenty of time left for that was important, too. 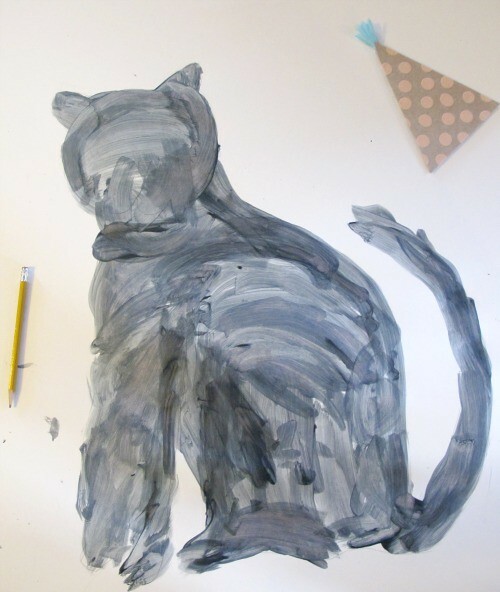 I love the painting your daughter made of the cat. She's very talented. This party is a true inspiration. We don't have any birthdays until November and then we have them all one after another but I am going to try to keep some of these ideas in mind until then. That looks like it was such a fun party! Your daughter is so lucky to have a mom like you. thanks! can you tell I had a lot of fun, too!? Greelyrita- she's 6. We used a photograph for inspiration for the shape of the body. She spends many hours of each day drawing... so as much as it is one of her gifts, she also practices quite a bit. However, I agree... it's a great cat! It sounds like they (and you) had so much fun! I love love love parties that are creative and handmade vs those that just buy everything at the party supply store. bore. well, thanks for taking us to the party! i want you to throw my next birthday party. ;) those masks are cool! I love the "low pressure/low maintenance" aspect of this party! I hope that came out right, I don't mean that it didn't take effort, just that it seems like a relaxed atmosphere that wasn't over the top. Great job! So much fun. i love her cat and those little wooden peg cats of yours. I totally get what you mean by "low pressure/low maintenance". Sure, I put a lot of thought and energy into the day, but I didn't kill myself over every single detail... I had fun and I'm glad it shows. Oh my gosh, so much to comment on... the stick-the-hat-on-the-cat cat: true love! 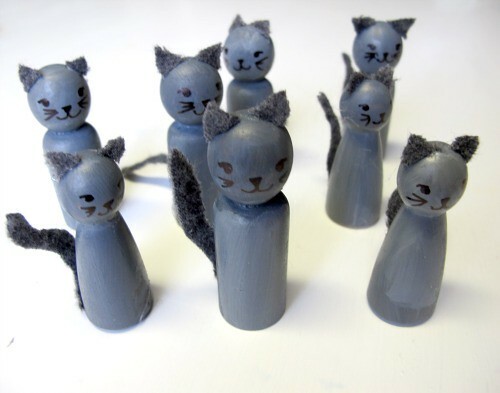 The little grey cats: cutest. favor. ever. The favor-bags-on-the-mantle tradition: really a lovely tradition. Your living room: gorgeous and light-filled. The party bags themselves: perfect! 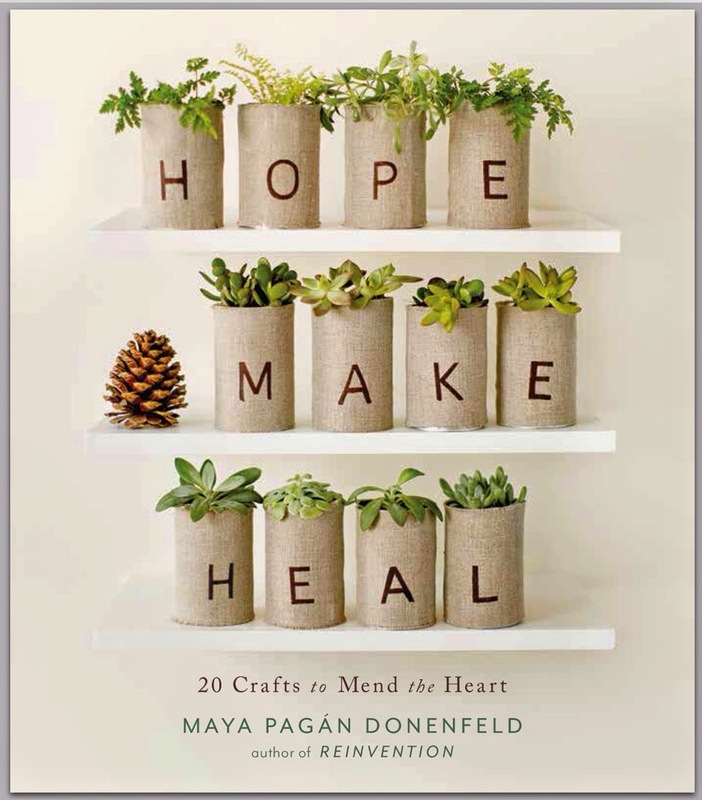 The whole eclectic theme: inspiring. 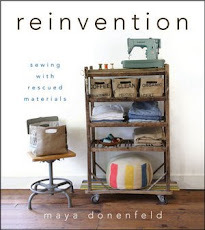 "I sort my scraps by size and color": Maya my dear, you inspire at every. single. level. 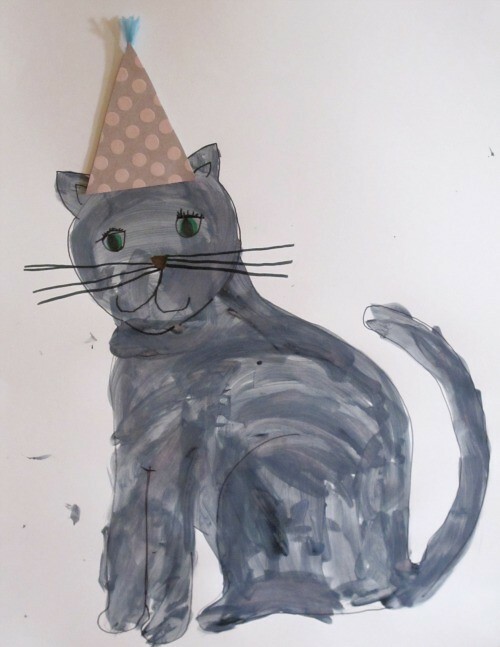 This looks so nice Maya, the cats are so nicem, the pinata, tha masks...I know two lovely girls in my house who would love a party like that! This has got to be the neatest theme party I've ever seen! It's so refreshing from the store-bought name-brand stuff. I love it, maybe I'll have a cat party! LOVE the party bags. I love how you just casually throw in that you 'carved a party cat'... yeah, can just see myself whipping up a cat stamp of my very own. I think you take for granted just how amazingly creative and clever you are. Us mere mortals can only sigh and enjoy the aftermath!!! fantastic theme for a party; Edgar, arwen and lord byron think its the cat's meow!! This looks like a lovely party and one my own daughter would have loved. I used to love to throw "hand made" parties like this when my kids were younger- we've had pin the wand on the fairy, pin the fire on the dragon, pin the spout on the whale, just to name a few. But I have to admit that after 4 children (oldest 16, youngest 10) I've just run out of steam with all of this. They're lucky if they even get a decorated cake these days. And I feel SO bad about it. But I just can't seem to find the joy in it all anymore. 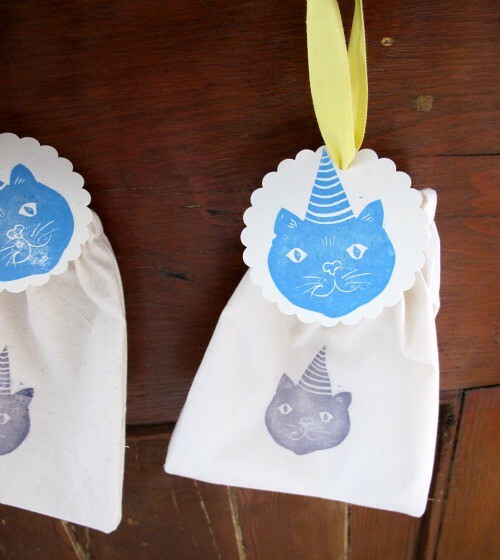 those cat party bags are so sweet! love that you stamped them! The cat stamp - on the bags and card are adorable!